Most puppies will 'come' to you whenever you decide to walk away because they instinctively follow you. Making this a reliable response, however, usually takes months of consistency and positive training. The easiest way to associate your new puppy or dog with the 'come' cue is to begin using it as soon as you bring him home and build the word up slowly. When going through the following stages make sure you are motivating and exciting so that coming back to you is always a good experience for your dog. Set your dog up for success by making it easy for him to respond and make sure you go at your dog’s pace, only moving to the next stage if your dog is proficient. 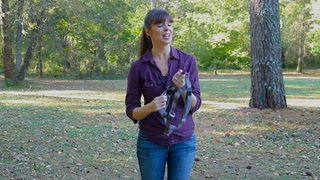 The recall cue is most important for safety and should be the first cue you teach your puppy or new dog. Building a good foundation is key to getting a reliable response. Start in a distraction free environment so that your dog can focus only on you. When he gets to you, make a big fuss. With this exercise, your dog will learn that coming to you is a really good thing. After a while, you can lengthen the distance between you and start using the word when he is coming to you from a greater distance. Coming to you should always be rewarded, whatever the circumstance and no matter how long it took your dog to respond. you the best thing he can do. Make sure you play the Back and Forth game with another person that your dog is comfortable with. Start the game in a quiet environment so it is easy for your dog to focus on you. When the cue word is given, release your dog and let him go running to the person calling. As soon as he reaches them they should praise and reward him with a game of tug or a food reward. When your dog has had his reward, have the other person hold him back as you call him and release as you say his name followed by the cue word. When he comes to you reward him with another game of tug or food reward. Repeat this game back and forth but only do a few repetitions so your dog does not get bored or too tired. Keeping it fresh means the game is always fun to play. Now your dog knows what the word “come” means you can use the cue word to call him to you while adding a hand signal to the word. Hand signals are always good to build with vocal cues so that even if your dog cannot hear you he will understand what the hand signal means. This is good if your dog is a distance away from you. Start in a quiet environment. Walk away from your dog and call his name followed by the cue word and a hand signal. Praise and reward him when he comes to you. Start increasing the distance you call him from and praise for his compliance. If he does not respond, go back to the previous distance and repeat. Only practice this cue for a few minutes so your dog does not get bored. The secret to success is to always keep it fun, exciting and fresh. When your dog recognizes the hand signal, try calling his name and using the hand signal by itself without the vocal cue. You will then be able to use a combination of vocal cue only, hand signal only and the two together. Now your dog knows what the cue word means you can start to call him from different rooms or from areas where he cannot see you. This will encourage him to respond even when you are out of sight. Now your dog is consistently coming to you in a distraction free environment you can proof your recall cue by taking it outside. Practice the recall in your yard and then gradually build up to the point where you can use it in the park or similar environment. The ultimate test is to use the recall when your dog is engaged in a different activity. Wait for a lull in that activity and then call your dog to you. Praise his decision to comply. 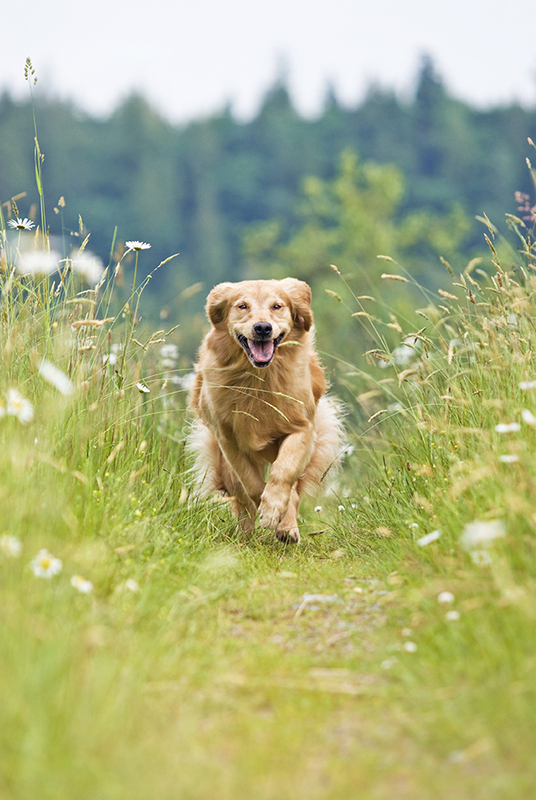 If you want a reliable recall, do not chase your dog unless it is an emergency. Dogs love to play the game of chase. If you call your dog a number of times and he does not come back to you, do not reprimand him when he eventually returns. It is understandably annoying when your dog ignores you, but if you get angry when he finally returns he is unlikely to respond the next time you call him. Under no circumstances should recall involve the use of a shock collar (remote collar, e-collar, etc). Problem: My dog will not come to me when called, especially when there are other dogs around. Solution: Dogs are understandably drawn to each other and it can be hard to get their attention when they are interacting with each other. If this is the case, wait for a ‘lull’ in the interaction before calling your dog back to you. If he complies, give him lots of positive reinforcement for his decision and then let him go and play again. Dogs are very smart and many soon learn that they only time you call them is when you want to put them on the leash and take them home. Calling your dog back to you and then letting him go play again changes that picture. Coming back to you does not necessarily mean his fun will end. Having a reliable recall is vital for the safety of your puppy or dog in all environments, and the sooner you start teaching it, the more reliable it will be.